« Big Changes for the Paranormal View! I’m thrilled that Freddy Silva will be joining us this Friday night to discuss the phenomenon of crop circles. He has a unique theory about the creation of the patterns, their meanings, and about the creators themselves. Freddy’s book, Secrets In The Fields, covers the factors that support his theory. 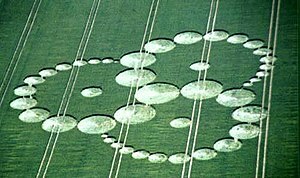 Check out Freddy Silva’s article about the connections of crop circles to the Apocalypse. This entry was posted on June 4, 2009 at 10:58 am and is filed under Aliens/UFO, Ancient Mysteries, Psychic Phenomena with tags Biophysics, Consciousness, Crop circle, Paranormal. You can follow any responses to this entry through the RSS 2.0 feed. You can leave a response, or trackback from your own site. Great interview, I’m listening to the podcast these days. I think it would be much better if… your microphones didn’t pick up any intrusive noises – keyboards, purring cats, etc. Thanks!